I’m looking for a 1994 Little Tikes No. 1548 11 inch blond doll wearing a yellow terry sleeper. There’s a green bear embroidered on the tummy, a white collar and cuffs, and a matching bonnet with a green ruffle. 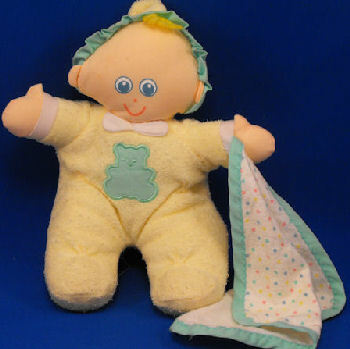 She’s holding a multi-color polka dot white flannel blankie with a green binding. My mother got this doll at my baby shower 17 years ago. She gave it to me when she brought me home. When I was a toddler I wanted more – I had at least 10 of them. We were moving out of state, so we packed 9 of them, and I was holding on to the other one. On are way moving my father didn’t close the door all the way and the box they were in fell out. Nanew (my doll’s name) has half a hand left, a hair dryer burn hole, rips, etc. We’ve looked for years, and when I finally saw a sold one on your site I was so excited I was crying. I want to find a new one for when I’m older and have a daughter, so that my daughter could have her as long or maybe even longer than I did. I’d really appreciate it if someone could find one. OMG I’ve been looking for the same thing! My parents bought me two copies back in 1996 when i was born and I am left with one copy with only his head 🙁 (we have sewed a body to him tho) . Thanks, Gone. I sent the link to Kelley and Brian. Let us know if and when found.